These trails are all in development, meaning that stretches are either paved or surfaced with crushed stone, dirt, or railroad ballast. Check website maps and contact the ECG for updates before heading out to a trail. Eastern Trail: (www.easterntrail.org). Perhaps the fastest-developing New England ECG section is the 69-mile stretch in Maine from South Portland to Kittery. The trail follows the old Eastern Railroad corridor, which linked Boston and Portland until 1944; only 16 percent of the trail (11 miles) is car-free now, but another 10.5 miles may be as well by the end of the year. A special bike/pedestrian bridge in Scarborough is part of one especially stunning section that runs through a 6,000-acre wildlife sanctuary. A state-approved bridge for bikes and pedestrians over I-95 in Biddeford is also slated for 2011. Southbound travelers can cross the Piscataqua River to Portsmouth, New Hampshire, using the current bridge’s sidewalk, but the ECGA will not consider that part ECG-worthy until the bridge has safer bike/pedestrian features. Blackstone River Bikeway: (www.blackstoneriverbikeway.com). This trail—a projected 20 miles in Rhode Island, 28 in central Massachusetts—will run from Providence to Worcester, linking 15 municipalities in all. It winds through or near some of the nation’s most historic landscapes and past memorials to the Industrial Revolution, like the new Captain Wilbur Kelly House Museum in Ashton (in the state park) and Slater Mill in Pawtucket, and also through sparsely traveled rural areas. In Providence, bikers can take city streets to connect with the fully off-road 14.5-mile East Bay Bike Path along Narragansett Bay—a great trip for families, too. 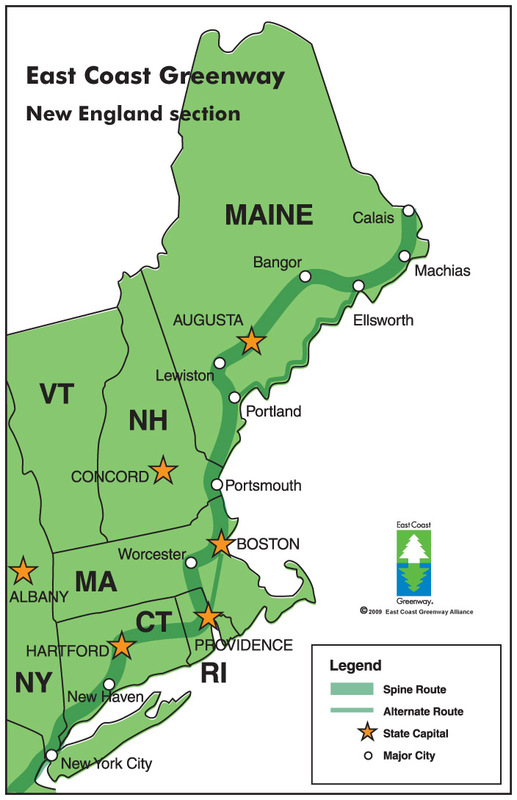 Rhode Island, where popular and government support for the ECG is strong, is way ahead of Massachusetts in construction, with more than 10 miles of paved, off-road pathway already, through Woonsocket, Central Falls, Lincoln, and Cumberland. Though Massachusetts has 2.5 miles of trail completed in southern Worcester and Millbury, the rest is progressing slowly; the Commonwealth ranks near the bottom of the list of states developing trails and paths for non-motorized uses. Although millions of dollars have been dedicated to design and engineering of the route, right-of-way problems exist in some sections and discussions continue about exactly where the final trail should go.